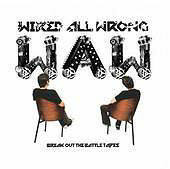 The first question many of you that have not followed closely over the last few years may have is “What/Who the heck is Wired All Wrong?” Others may have heard the WAW name thrown around in rumors over the last 5 – 6 years as Jeff Turzo’s “pet” project. Well the final form of Wired All Wrong is here and it’s Matt Mahaffey (of sElf fame) and Jeff Turzo (formerly of GLU) and it’s a fantastic combination! “Break Out The Battle Tapes” is currently available on iTunes and will be available in stores September 12. With the new release Jeff Turzo took some time to do an exclusive enjoyglu.com interview which is below. Thanks Jeff! Q: First of all, congratulations on the upcoming Wired All Wrong release. We had only heard rumors about the WAW project for the last 5 – 6 years until you landed on myspace last year. How do you feel for WAW to be seeing the light of day after all this time? What pieces fell into place to make you realize it was going to get finished? [Jeff Turzo] WAW has been a mystery (sometimes even to me) but the main thing that made me realize it would eventually become something to put out was when I hooked up with Matt. We were friends for years but never really worked on anything together. I gave him some unfinished tracks and he gave me one back with vocals and I knew once I heard the first verse it was going to be something to pursue. Q: Are there plans to get Wired All Wrong on the stage? Would we possibly see any past touring GLU or Self members in that live lineup? [JT] October 7th downtown LA Detour festival. Scott Garrett will be playing drums from GLU. I can’t wait for this. Q: You’ve worked with many different artists in many different roles (programming, mixing, producing, etc…) over the last few years. Has this experience influenced your own creative process in any way? [JT] I think it influenced me in an almost what-not-to-do way. Matt and I worked casually in our offtime on these tracks and made it fun and not work, whereas most of what I have done in the past few years felt like work. Q: Do you have any favorite pieces of studio hardware or software you use to kick off your creative process? [JT] My akai sampler – I load it up with some new vinyl bits and start playing and chopping. Q: One of the most frequent questions we get at enjoyglu.com is “Where can I find that sample cd by Jeff and Scott Garrett ?” Is Multitrack Murderer available any longer? [JT] Bits and pieces are on Big Fish Audio’s ‘Breakbeat 2’. Q: David seemed to have an extremely creative period in the 2 years leading up to his sudden passing. Do you have any comments on his work during this time? or comments in general about David’s solo work? [JT] I loved what David was doing – it was some of his best songs but produced in a pure Dave way – his setup was almost the same as when we first met however many years ago. He was great with a rock band but better as a more solo programmed artist – his music had more elements of experimental and psychadelic music (things I know he was greatly influenced by) in it. Q: Dave Sherman made a comment that you might be involved in finishing up some of David’s solo tracks. Can you give us any info on your involvement with David’s final solo album? [JT] Walt Bass and I went through some of the stuff some months back but it was too hard to delve into. I just realized I wasn’t ready for that yet unfortunately. Q: Are there any other projects you’ve been involved with you’d like to tell us about? [JT] Matt and I produced the new HelloGoodbye album which is out now. Q: When you’re not working on your own or someone else’s projects, what music or bands do you enjoy listening to these days? [JT] Jamie Lidell, Ween, any old vinyl I pull out. Q: Is there anything else you’d like to tell the enjoyglu.com visitors? [JT] Thanks for the support. I have a hard time keeping up online, but David as you all know lived on the internet and I know you all helped him tremendously by sticking by him here.